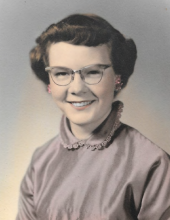 On Sunday, January 27, 2019, Wilma J. McGlone, a longtime Ponca City resident, passed away in Oklahoma City, OK at the age of 79. Wilma was born in Tonkawa, OK to Les and Alva (LeGrand) McPherson. She studied bookkeeping at Northern Oklahoma College. After graduation, she worked for a private accounting office and then for Conoco until her retirement. In 1963, Wilma married Joe McGlone, Jr. The couple resided in Ponca City for 50 years, raising two sons, Mike and Mark. Wilma loved to travel, read, bird watch, and collect beautiful glassware. She also loved music, a passion she helped pass along to her children. But her greatest love was her family. A Tonkawa native, she had many family members in northern Oklahoma and loved to visit with them throughout the year. She traveled the United States and Canada with her husband and children. Later, her grandchildren joined the family expeditions. Wilma was preceded in death by her farther, Les, her mother, Alva, and her beloved husband, Joe. She is survived by her son’s families, Mike and Lori McGlone, plus Mark and Sherry McGlone. She is also survived by her granddaughters Sarah Kraus and Jessica McGlone, and her great grandchildren, Emersyn and Carter Kraus. She is also survived by her sisters Billie and Judy, and many beloved nieces, nephews, and cousins. Friends and loved ones may pay their respects to Wilma at the funeral home on Wednesday, January 30 from 5-8 pm and Thursday, January 31 from 8 am-8 pm with family present from 4:00-6:00 pm. A memorial ceremony will be held at 10:00 am Friday, February 1, 2019 at Trout Funeral Home & Crematory, 505 W. Grand, in Ponca City, OK, at 10:00 am. Following the ceremony, Wilma will be laid to rest next to her husband Joe at Longwood Cemetery. Online condolences may be sent to www.troutfuneralhome.com. To send flowers or a remembrance gift to the family of Wilma McGlone, please visit our Tribute Store. "Email Address" would like to share the life celebration of Wilma McGlone. Click on the "link" to go to share a favorite memory or leave a condolence message for the family.